« I love dried seaweed! The summer after my first year in graduate school I spent a month in Hawaii as a teaching assistant on an archaeological field school, an awesome opportunity to take advantage of some of the wonders of the Big Island. One of my fondest memories of that time was the trip we took to the farmers’ market in Hilo one Saturday. I was so overwhelmed by the abundance of exotic fruits and vegetables that I’d never encountered before and I wanted to try them all. Fortunately there was one particular vendor who seemed to specialize in catering to the needs of people like myself, neophytes to the tropical fruit world, and was more than happy to explain the differences in all the new produce that they had available. I walked away from that market with a huge smile on my face and a great deal of new flavor adventures stored up in my bag. One of those adventures was the dragon fruit. The dragon fruit I had that summer was amazing to me. The fruit itself was so beautiful, with its magenta exterior with the little green leaves and an even more brilliant magenta interior with tiny black seeds (similar to what you find inside a kiwi). I was in total awe of the brilliance of the color in this fruit. And the flavor was nothing to sneeze at either. It was perhaps a bit subtler than one might expect, given the overwhelming visual appearance, but it was sweet and juicy and entirely satisfying. This entry was posted on October 17, 2007 at 1:49 am and is filed under Food. You can subscribe via RSS 2.0 feed to this post's comments. You can comment below, or link to this permanent URL from your own site. When reading this found it a bit off putting, as it says it was unlikely to buy a magenta coloured fleshed dragon fruit, but, nevertheless I bought and tried this fruit. It did not have (as I had hoped) magenta coloured flesh, but it tasted lovely and I thought it would make a gorgeous sorbet. I put it in the freezer for one day, and the outcome was amazing. So I think that any dragon fruit has a lovely taste, especialy as a sobet! I first bougth a dragon fruit tooday. I never eat it. I bought my first dragon fruit yesterday after years of having dragon fruit flavored this and that. It was a white and I must say…. tastes an awful lot of nothing. As with all vegetables and fruits it matters if it had time to ripen on the plant. White dragon fruit fresh from the “tree” in Vietnam is delicious. The Dragon fruit, white, does not really have a distinctive taste or flavor, it is eaten in Vietnam for it’s cooling or cool effects. The Magenta colored Dragonfruit/Pataya is the real flavorful one. It is extraordinarily expensive to import and even more expensive to sell etc. 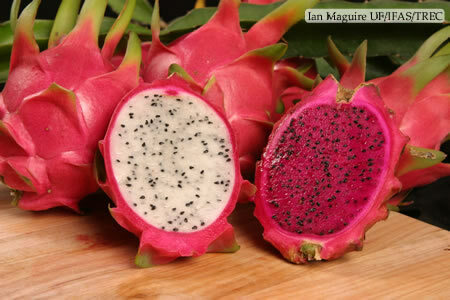 However the Magenta one’s are the sweetest and one of the best tasting of the dragon fruit. For the first time I ate drgaon fruit yesterday, the white flesh ones. They were awesome.